For this review, we got to try a product from Writing With Sharon Watson. The company offers writing curriculum for students in grades 5 and up. 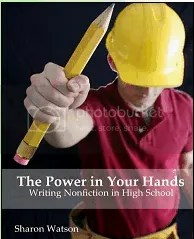 We used The Power in Your Hands: Writing Nonfiction in High School curriculum set. This program was written as a follow up to the popular Jump In writing curriculum for middle schoolers. This curriculum is intended for high school students, and I used it with my 9th grade son. The student text contains lessons on all the major types of writing students will encounter in high school and college. Each chapter is broken into daily lessons, with some chapters taking a few days, and others taking about two weeks. We began with the first section of the book, opinion and persuasive essays. I liked the fact that the lessons were written to the student in a clear, conversational tone. My son was able to read and follow the lessons on his own. For the most part, lessons took him an average of 30 minutes to complete. Each day contained a short lesson that allowed him to practice what he was learning about. The lessons build on each other, and I can see how, when they are completed in order, your child will have very strong writing skills at the end of the program. The lessons we worked on included topics like how to organize your thoughts when you brainstorm, which gave my son a repertoire of methods to choose from. He liked the writing assignments because they were not difficult, but I could tell he was really understanding the information! Some of the lessons also included evaluating writing samples based on what was learned in the lesson. I think this is a very valuable way to teach writing. Having students analyze others writing to look for errors will help them edit their own. At the end of the chapter, there was an assignment to write an essay using the skills used in the lesson. Each essay had a word count and clear directions. I would assign a due date for the essay (usually 1-3 days depending on the length of the essay) and my son would turn it in. The teacher’s guide included a checklist for editing and a list of popular editing symbols, which I let my son use when he did his own editing. He could also refer back to it after I edited his paper. The teacher’s guide portion of The Power in Your Hands is awesome! First, it has a section on “14 minute power surges”, which are short, daily writing assignments to give your kids more practice. There is a prompt for every day, and the work is not graded. The author simply wants to get kids in the habit of writing every day! As an English teacher, I feel this is very important. Writing is a skill that grows with use. While writing daily may be a struggle at first, it DOES get easier with practice. And the fact that the writing surges are not graded takes the pressure off. I did these short prompts with my son as part of his journal three days a week, and I can tell you, as time went on, the ideas came to him faster and faster. There is also an extensive section on how to grade papers. Each style of writing has its own rubric (students have copies of the rubrics in their workbook, so the expectations for their papers are very clear), and there are even examples of what an “A” paper and “B” paper and so on look like! This makes it so easy to score your child’s writing! It also makes it easy to explain to them what you are looking for in their papers. I feel that The Power in Your Hands is one of the most solid high school writing programs I have seen. I truly believe that if you use this program in your homeschool, you will develop a student with strong writing skills they will be able to use in college and beyond. This book would be excellent prep for the writing portion of the SAT. With 23 chapters and over 100 daily lessons, this book is a very full writing curriculum. If your child is a reluctant writer, you may want to go slower, and spread the curriculum over two years. I plan to use this program again when my younger son gets into high school (at this point, I am seriously considering Jump In for him next year, he needs help with writing and if it is similar to this program, I think it will work!). The student text costs $39.98, and the teacher’s guide is $14.98. I would strongly suggest you purchase the guide to go along with the book, and I think that the price is absolutely worth it! I know I have mentioned before how much I love my crock pot. 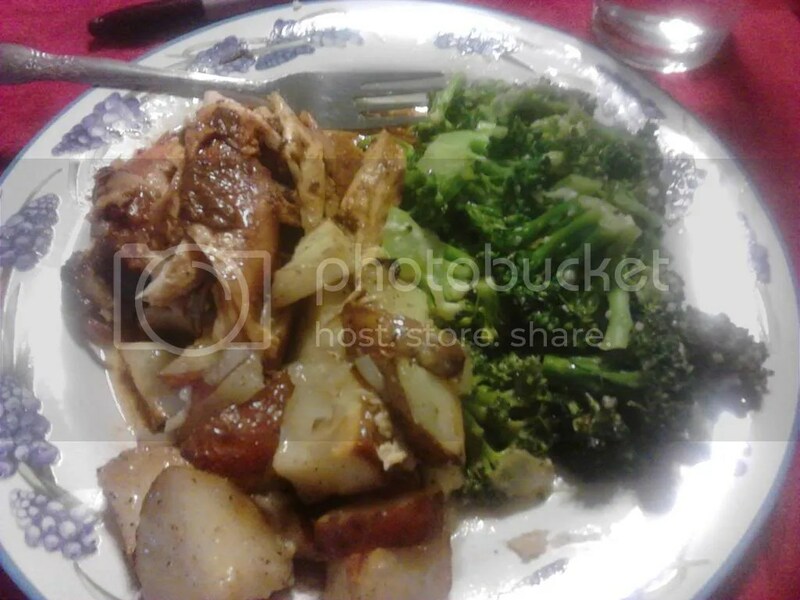 This recipe has two parts, the chicken in the crock pot, and potatoes in the oven. It is pretty easy to make, and tastes really good! 1. Place the chicken in a slow cooker sprayed with cooking spray. 2. Combine the other ingredients in a small bowl and whisk and then pour them over the chicken. 1. Chop the potatoes into 1 inch cubes and slice the onion. 2. Place both in a large bowl and drizzle with the olive oil. 3. Add the salt, pepper, and garlic powder and toss to coat. 4. Place in sprayed 13×9 inch pan and bake at 425 for an hour. Turn the potatoes halfway through cooking. Serve with your favorite vegetable! The topic for this week’s blog cruise is “When Things Don’t go as Planned”….wow, I have way more experience with this topic than I want to! I will admit it, I am one of those people that likes structure! I have a notebook where I plan our homeschool days. I have a color coded calendar where I keep track of appointments, meetings, and events. I even plan our vacations, deciding which days we will do which activities!! I am not, by nature, a “go with the flow” kind of girl. Of course, as we all know, life has a way of messing up your plans. Sigh….sometimes it seems like I have entire seasons where NOTHING goes the way I pictured it, and honestly, it frustrates me!! At moments like that I find I have to step back and try to give myself a vision of the big picture. Examples? Well, as we neared our second semester last year, I looked at our curriculum and sketched out a plan for the rest of our school year. We were actually going to complete all of our math and science curriculum in one year!! Woohoo! I was excited. Then, my hubby gets injured at work….a knee surgery that was supposed to require a six week recovery resulted in six months of therapy and doctor’s appointments etc. etc. Suddenly our school days became a question of “How much can we get done while driving in the car and sitting in a doctor’s office?”. Needless to say, we did not finish said curriculum like we were supposed to. We ended up finishing up at the beginning of this year instead. Sigh…. Another example? We are supposed to move out of our old house on “X” date. Fine, we have a few months to find a house and pack. We can school around that and take a break the week we move and everything will be fine. And then…a knock on the door. Guess what? The bank has decided we need to move. NOW! Ummmm, one week to find a house, pack, get the electricity, water, etc. transferred? Can you say panic attack?? Honestly, I just wanted to bury my head under the covers and never come out. Forget schooling, and a nice leisurely move creating only a small bump in our schedule. We were launched into a frenzy of house searching, late night sorting and packing, and endless phone calls! I intended to at least have my kids read independently at that time, but even that didn’t happen (mostly because the books were boxed up who knows where!). And then after scrambling to move, it took another two weeks to sort through everything and find our books again. I swear, our lives didn’t return to some semblance of normal for a MONTH! That was absolutely not what I pictured and it drove me crazy! Then there are the day to day interruptions. You or one of the kids gets sick, an impromptu visit from relatives, the need to go help a friend or family member when something comes up, car trouble, computer trouble, plumbing back ups (ugh!). Some days I go to bed wondering if I actually accomplished anything at all. Stuff like that can be a real joy killer for a “plan everything to last detail” kind of girl like me. So, what do I do to keep myself from going insane at times like this? I try to remind myself to look at the overall picture. Yes, we do get behind in our school from time to time. No, we typically do not finish all of our curriculum in one school year. However, my kids are learning how to adjust on the fly when necessary, and if their lives are anything like ours are now, they are going to need that skill. They are also learning that there are times you just need to drop what you’re doing to help someone out. And if something unexpected happens (like an injury), it’s perfectly okay to set some things aside to deal with that. My boys are learning first hand that things don’t always go the way you think they will, but that doesn’t mean you just throw your hands in the air and give up. You find ways to work around, or through, the problems. You prioritize the things that are truly important, and don’t worry so much about the other stuff. You TRUST that God has the situation under control, and you just hang on and let Him guide you. I remind myself in these moments, that I am not homeschooling just to prepare my kids for college. I am homeschooling to prepare them for life. And life is sometimes a messy, sticky, bumpy journey. If I want my children to be adults that can face challenges, I need to let them see me dealing with them now. These life lessons are sometimes far more important than book lessons. If they can learn flexibility at this point in their lives, it will greatly benefit them in the future. 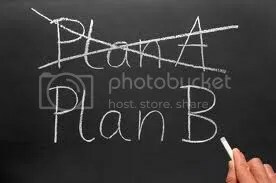 I wish I could say I have learned to take challenges and changes in plans in stride, but I haven’t yet. Sometimes I think God purposely throws some of these things my way because He is trying to teach me to be flexible, and to let go of some of my need to control everything (because, after all, I really can’t control everything, can I?). I am learning to deal with changes with a more positive attitude, and I find that keeping things in perspective really helps. In my family, we are fans of spicy foods. Today’s recipe is a new crock pot recipe I decided to try. After having a similar sandwich at a local restaurant, I decided to come home and try to make it myself! I have to say, it came out really well. If you like a little kick in some of your meals, give this one a try. This recipe is easy, and needs only a few ingredients, which you may have in your kitchen already! 1. Spray slow cooker with cooking spray, or use a crock pot bag. 3. Mix ranch dressing and hot sauce together and pour over chicken. 5. 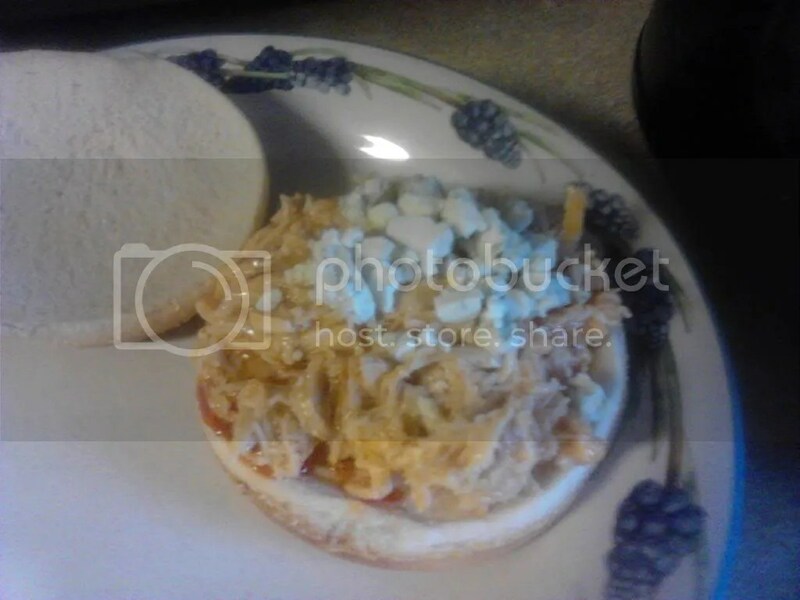 Shred chicken and place on buns, top with crumbled blue cheese. Progeny Press creates literature study guides for children in grades K-12. They have hundreds of guides available and for this review, we got to sample two of them! We used The Hobbit Study Guide, and the Treasure Island Study Guide. We received both guides as a download to the computer. The Hobbit study guide is intended for high school and, having read the book more than once, my oldest son wanted to dive right in! However, I made him slow down a little, so we could discuss the introduction and how the guide worked. Each guide begins with a synopsis of the book and a section that gives background on the author. There are also pre-reading activities included. These were interesting, and, even though we had read the book before (both as a read aloud and my son on his own) we still completed these activities. They were simple, but did give us some new information to relate to the book. I decided to have my son re-skim the chapters as a refresher while he completed the study guide. It is divided into sections by chapter, with vocabulary and other questions and activities for each section. The most awesome thing about these guides for the computer is that they are interactive! My son could just read the questions and click or type his answer directly onto the computer!! This made doing the work much easier. There were also additional activities included, for example, a section of the guide talked about “characters” and how they are used and developed in stories, and one of the activities was to write a character sketch on someone from the book. I also appreciated the “dig deeper” section, where there were questions that related the book to passages from the Bible. Typically, my son and I would read the passages together and use these questions for discussion. I was impressed with the amount of discussion on literary devices and story elements in this guide. In addition to characterization, there were lessons on metaphors, epithet, and setting, among other topics. I think it is important that children come to know these terms, especially while in high school, as they will likely hear them frequently in college literature classes. The guide ended with several topics that could be used for essays, as well as a few creative projects. I had my son choose one of each, and he actually enjoyed doing them. Since there were so many options available, he did not have trouble finding something to write about! The download includes an answer key, as well as an introduction letter that explains how to correctly enter answers on the guide. We found both of these to be very useful. 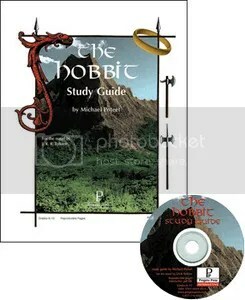 The cost of the instant download for The Hobbit study guide is $18.99, and I think it is well worth it! The second study guide we got to review was the guide for Treasure Island. This one is intended for middle school, so I used it with my 6th grade son. This guide is also interactive, and is set up in the same was as The Hobbit guide, with a synopsis, author information, and pre-reading activities. My son had not read this book before, so we went through this one a little more slowly. We actually spent the first week focusing on one pre-reading activity a day, to give my son some background on the book. He found these very useful, as they gave him some information to relate the story to as he was reading. Because of the old style of language used in Treasure Island, he has needed help getting through some of the book, so we have been reading some sections together. My son has found the vocabulary sections of the guide to be particularly helpful. Again, the amount of literary instruction in this guide is impressive. There were lessons on mood, foreshadowing, stereotypes, and other topics. The “dig deeper” section gave us many appropriate biblical passages to read and apply to the book, leading to much discussion. We are almost finished with this guide now (as I said, my son is working through this one at a slower pace) but I have looked ahead to the end of the guide, and I already see three or four projects my son is going to want to do (some of them related to pirates 🙂 ). My second child is not a big reader anyway, and the language of Treasure Island has been somewhat off-putting for him, but he loves the story, and because he can easily do this guide on the computer, it hasn’t been much of a struggle to get the work done. 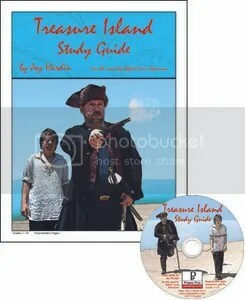 The Treasure Island instant download costs $16.99 and also includes an answer key. In my opinion, it is definitely worth it! That is my baby…or, I should say, that WAS my baby about 11 years ago. In a week or so, this “baby” will be 12! 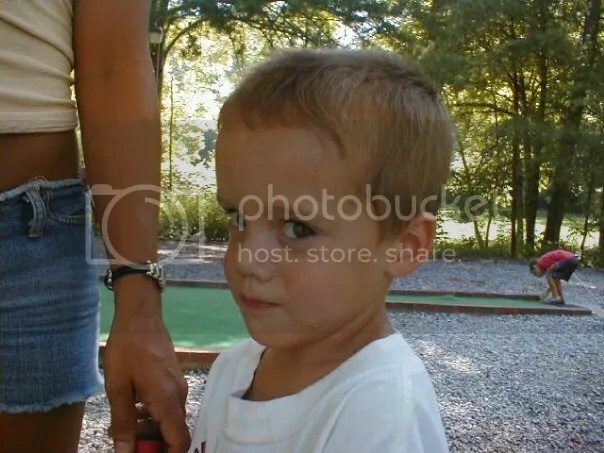 I can’t believe it….my oldest son will be driving soon, and my baby is almost a teenager! GASP! I’m not ready, and this makes me feel OLD! 🙂 As I sit here today, pondering the fact that my children seem to be growing up much faster than I imagined, a few things occur to me. First, I am so completely thankful that we are able to homeschool. Because we do, I still get to spend all of my time with these boys, so I can soak up every precious moment I can before they leave our home. 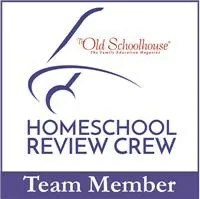 Secondly, I am thankful we homeschool because it has allowed us to keep our kids younger for longer. Even though this boy is turning 12, he doesn’t act like a lot of 12 year olds we know. He still loves his “stuffies” that cover his bed, he loves superheroes and legos and cartoons, and he still likes to crawl into mom’s lap for a snuggle, and listen to me read to him. Those are things that make this moms heart swell with joy. 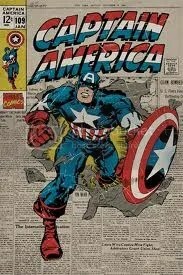 Captain America is his favorite superhero ever! We have a Captain America costume from two years ago that he still wears, sometimes just because he feels like being “Cap”. His room is full of Captain America playsets and action figures, and the shield he got a few Christmases ago is still one of his favorite toys. This boy has an incredible imagination, and he amuses himself for hours playing “Avengers” in the backyard. He isn’t afraid to play pretend, he doesn’t feel the need to be glued to a cell phone or facebook like many of his friends. He just wants to have a good time, and I love that about him. I think that because we homeschool, we have been able to extend his childhood just a little bit longer and encourage his imagination, and I think that is a good thing! This boy is also my crazy, free-spirit who will try anything. We have a hot dog stand nearby that has at least 50 different crazy hot dogs. When we moved into our house, my son determined he was going to go there and try them all. 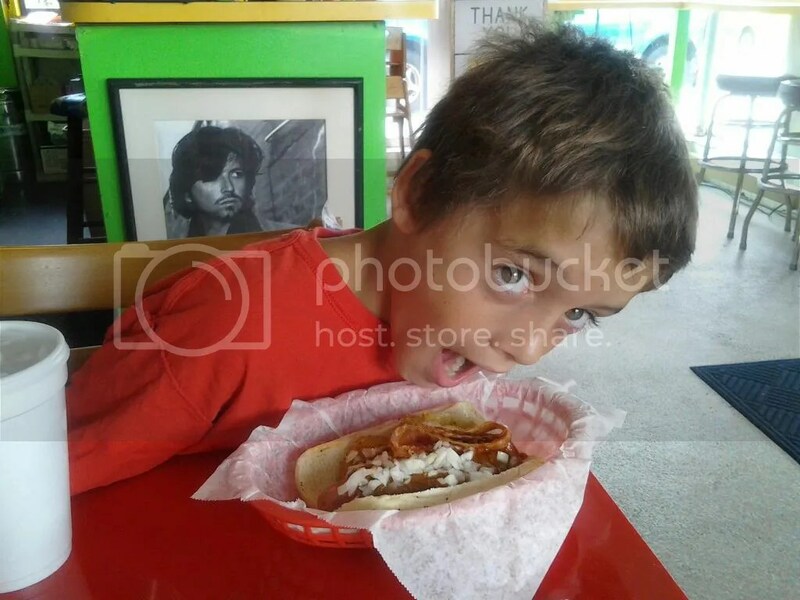 Whenever we stop there for lunch (about every couple weeks, it’s nearby and cheap 🙂 ) he tries some new outrageous hot dog!! Like hot dogs fried in tortillas with sour cream and guacamole and bacon!! But that is just who he is. My son is completely unafraid to try new things. He is not inhibited by worrying about what other people will think, or trying to fit in with the crowd. I think part of that is because we homeschool as well. He isn’t faced with the pressure of “fitting in” everyday, he just gets to be who he is! Finally, I will say that this boy has an incredible sense of humor! He is the resident family prankster (much to his older brother’s chagrin 😉 ) and if you find yourself covered in toothpaste, or water, or with play doh in your shoes, he is the likely culprit! 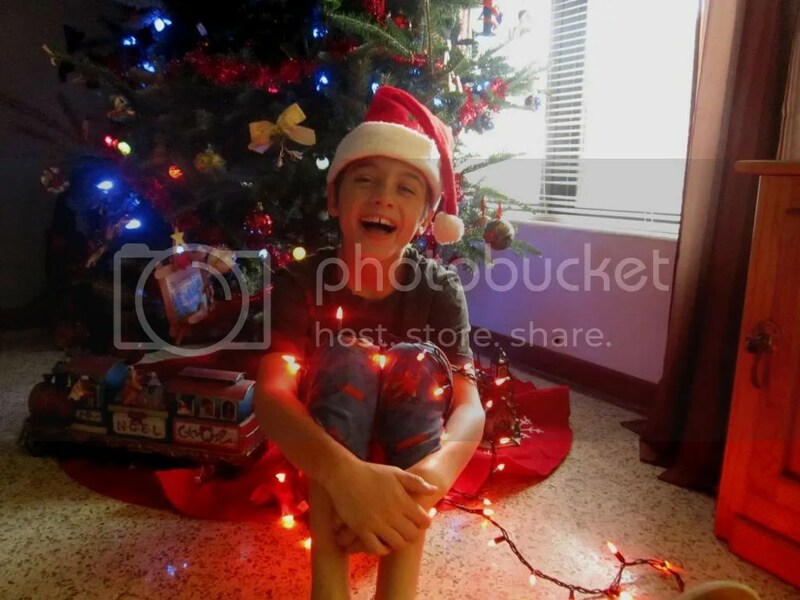 My youngest just loves to make people laugh, and he is good at it. He is the kind of kid that will introduce himself to the new kid in the neighborhood and instantly become friends. Or, he will notice that child sitting alone at a gathering and ask if they want to play. He is very sensitive to the feelings of others and likes to make people happy. I love my goofy, silly, carefree, creative and loving boy so very much! While it is hard for me to accept that he is growing up, I am excited to see the life the Lord has planned for him. I guess that as my kids get older I see the importance of homeschooling them even more. I want my kids to grow up to be themselves, not carbon copies of their friends. I want to encourage their unique gifts, talents, and personalities, and I feel like I can best do that when they are home with me. So, Happy Birthday little man, I am so proud you call me mom, and so very glad that my days are spent with you. Leadership Garden Legacy was created by Debra J. Slover. After working for years with an Oregon youth leadership program, she decided to start her own company aimed at “empowering the unstoppable leader in each of us”. For this review, I got to sample two of her books. 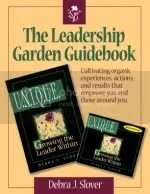 U.N.I.Q.U.E: Growing the Leader Within, aimed at older teens and adults, as well as U.N.I.Q.U.E. 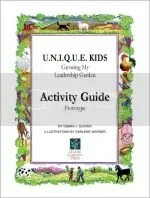 Kids: Growing My Leadership Garden aimed at children ages 8-12. Both books tell the story of Hugh, the sheep, and his journey from being a frightened, timid sheep to becoming a self-confident leader. I will admit, both my 6th grade son and I had a hard time with the story. It just really didn’t appeal to us. With the adult version of the book, I found myself skimming the story to get to the lessons themselves. Debra weaves the lessons in with parts of her personal story, and I found these to be very powerful. There are also exercises at the end of each chapter, that can be done in a notebook, or with the Leadership Garden Guidebook. Both the book and the guidebook cost $18.95. I appreciate Debra’s honesty in sharing her story with her readers. This made the program more authentic and easier to relate to. I did find some of the exercises to be a little “fluffy”, but I am not really a self-help book kind of person. I did not have a lot of success with the U.N.I.Q.U.E. Kids book. Even though it is beautifully illustrated, my 6th grade son just could not get into the story. I read it out loud, I asked him to read it, but alas, he was just bored. We ended up using the questions at the end of the chapter for discussion, and just skimming the story for the parts that applied to the questions. Some of the questions did cause my son to think, but he spent a lot of time rolling his eyes at me! I will say that he is at the end of the age range for this book, and you might have more success with younger kids. The U.N.I.Q.U.E. Kids book costs $18.95. We also received downloads of MP3’s for both books, as well as the U.N.I.Q.U.E. Kids Activity Guide & Journal. We did not use the MP3’s very much, but we did check out the activity guide. 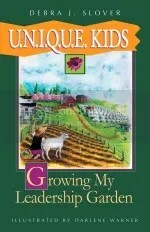 This is full of kid friendly activities to apply what is being learned in the book. My son enjoyed some of these, especially the cookie activity! I was also surprised at how accurate his self-assessment was. Honestly, I think he enjoyed doing the activities more than he liked reading the book. These activities did provide some opportunities for discussion, but I’m not sure they would actually translate into more than that. The PDF download for the kids activity guide costs $8.95.